The lightweight ISP BookletMate Booklet Maker sets up in just seconds, while offering a simple operation. All the user has to do is place your document on the BookletMate table, move the side guide until both sides touch the edges of the set, use hand lever to operate the staplers and reverse hand lever to fold. The completed booklet is stapled, folded and ejected out of the fold rollers. 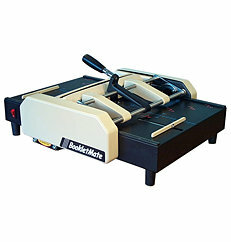 The BookletMate staples and folds up to 12 sheets paper at a time with two staplers and four stapling positions. Changing the paper size is quick and easy with the adjustable side guides that automatically center the sheets. If you have any questions or are interested in purchasing the ISP BookletMate Booklet Maker, visit us at SpiralBinding.com. We have great pricing on a full line of Desktop Bookletmakers. Call us at 1-800-631-3572 for more information!